The following news release was issued by the Canadian Institutes of Health Research. Canada is home to highly trained and creative health researchers, and the Government of Canada is proud to support their important work. Today, while touring the research facilities at the University of Prince Edward Island, Sean Casey, Member of Parliament for Charlottetown and Parliamentary Secretary to the Minister of Fisheries, Oceans and the Canadian Coast Guard, on behalf of the Honourable Ginette Petitpas Taylor, Minister of Health, highlighted a recent federal investment in health research. The $745,000 awarded to UPEI is part of a $275 million national investment to support Canadian researchers studying the full spectrum of health issues affecting the lives of Canadians. This investment in health research supports our economy and creates high-quality middle-class jobs. Every $100 million invested in health research represents 1,800 jobs for researchers and trainees. MP Casey met with grant recipient Dr. Adam Johnston to celebrate his achievements and to learn more about his research project. Dr. Johnston is investigating whether a special cell found in small nerves in the skin could hold the answer to treating non-healing wounds, such as those experienced by people living with diabetes. “Congratulations to Dr. Adam Johnston on receiving this funding from the Canadian Institutes of Health Research. With this support, Dr. Johnston and his research team will be able to carry on their world-class research, bringing pride to UPEI and the promise of improved health and quality of life to Islanders. "Neuropathy and wound healing deficits are two of the most common complications of type-II diabetes; however, their interrelationship has not been explored. Here, we will investigate if the impairment in diabetic wound healing is potentially due to the loss of nervous system cells, known as Schwann cells." 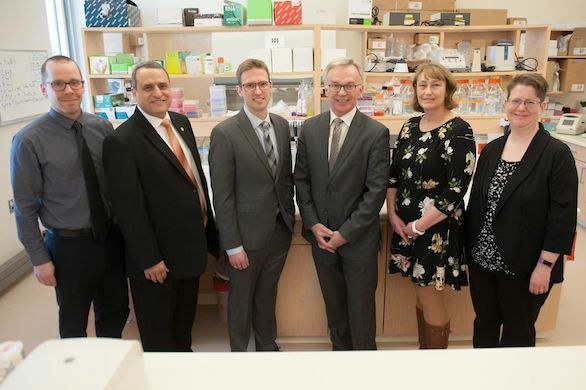 "Dr. Johnston is an outstanding scientist, and this is a tremendous opportunity for his lab and students," said Dr. Alaa Abd-El-Aziz, president and vice-chancellor of UPEI. "I'm excited to see the collaborations this research will bring between researchers in the Faculty of Science and the Atlantic Veterinary College. This represents the building of research capacity and scope by sharing expertise. It's an exciting time at UPEI." The projects funded through the $275M investment are supported by the Canadian Institutes of Health Research (CIHR)’s largest funding program. This program, called the Project Grant program, is designed to capture ideas with the greatest potential to advance health research and the health care system. It supports projects of varying sizes and duration through a highly competitive and rigorous review process. CIHR runs two Project Grant competitions per year. The results from the latest competition were released in January 2019, and the funding ($275M) will begin on April 1, 2019. Eighty-two of the grants from the latest competition were awarded to early career researchers (those within the first five years of their first academic appointment). Eleven of the grants funded are focused on Indigenous health research. CIHR is proud to support these projects as part of its commitment to invest 4.6% of its annual budget in Indigenous health research. At the Canadian Institutes of Health Research (CIHR) we know that research has the power to change lives. As Canada's health research investment agency, we collaborate with partners and researchers to support the discoveries and innovations that improve our health and strengthen our health care system.